May 20th was a good day at Eastern Neck National Wildlife Refuge (Rock Hall, Maryland…On the Delmarva peninsula). The morning sky was mostly clear, with passing clouds here and there. I tried to disregard the fantastic airshow above and around me…Osprey, Bald eagles, Turkey Vultures, Indigo buntings, Ruby throated hummingbirds, Great blue herons, Mockingbirds, Cardinals…. Butterflies were why I came to this Refuge, surrounded by Chesapeake Bay. The Butterfly Garden, planted next to the house that the Ranger lives in, was planted with nectaring plants, but they were not in flower as of yet. The trails were fun, but didn’t yield too much butterfly action. There were a pair of 50 foot trees near the Rangers’ house, in full, and I mean full bloom! Perhaps hundred of thousands of white blossoms, each producing a faint aroma, not unlike vanilla. The leaves were Holly leaves. Bees of many species were flying around and around the larger tree, oddly not landing, but flying. Protecting their claimed sector of treescape? I photographed the tree and its blooms. And I wondered. If most of the native plants are not yet in bloom, and most of the nearby garden is still developing its blooms, will butterflies be drawn to these katrillion flowers on what I think is an American Holly tree (Ilex opaca Ait.). I waited. Waited. Then there one was. It was a good sized butterfly. A brushfoot. Which one? Then it came closer. 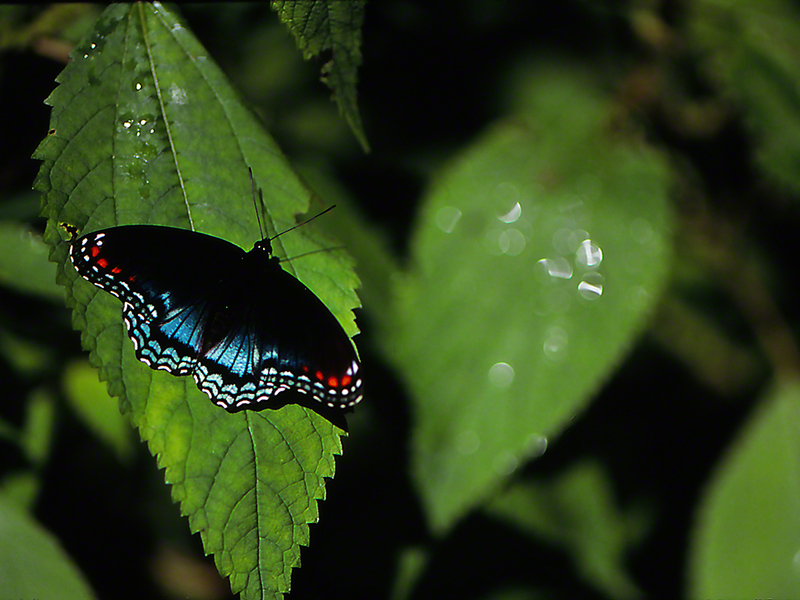 A red-spotted purple butterfly. Characterized as a generalist, a species that seeks sustenance from a large variety of flowering species. It never came close enough for a solid macro- photograph. The table was set, the settings were overflowing…and Red-spotted purple butterfly dropped by to enjoy some of the hundred of gallons of sweet that our tree was pumping. Note: This is not an image of this butterfly on American holly.